Today, we’ll be covering another WeChat feature that can sharpen your marketing strategy; the WeChat Official Account. WeChat has been the gateway for global brands to enter the Chinese market. Because of its outstanding features and wide reach, WeChat became every marketer’s best friend. In fact, there are 10 million official accounts to date. 1. WeChat Subscription Account – Subscription account allows you to post one message per day. Your published content will appear in your followers’ Subscription Folder. They have to check this folder to access your content. Users can share your update on their “Moments” tab, which can give you more exposure. However, not all users always check their folders. To create a long-term relationship with your followers, you need to give them reasons to check their folder. Offering them a discount or exclusive content is just one of the strategies you can use. If your marketing strategy centers on publishing content, this account is for you. Most newspapers and magazines use Subscription accounts to broadcast information daily. 2. WeChat Service Account – Service account lets you post four messages in a month. Unlike the subscription account, your updates will appear on your followers’ personal feeds. Your followers will also be notified every time you post. WeChat Payment – Accounts are linked directly to WeChat’s e-wallet service. This is convenient if you’re part of the e-commerce scene. Your followers and customers can easily process their payments within the app. Supports different QR codes – This is helpful if you use different codes for your store and website. You’ll have the ability to track which channel generates more traffic. With the help of service accounts, you can give your followers perks like booking and order services. For example, if you’re running a hotel, users can book a room within WeChat. This is a huge advantage for your marketing strategy. 3. Enterprise Account – This account is not visible to a normal user. It’s only designed for internal company use. Here employees can share memos, private group chat or manage tasks. You can use this to spread internal newsletter or announcements. Prepare the required documents such as your Chinese business license and organization code. You’ll also need a Chinese phone number and a Chinese ID. Go to WeChat Public Platform and click Register. Enter your email address and check your email for the verification link. Click on the link to verify. After verifying, you’ll be sent to a page to choose the type of account you want. Verify your bank account. You have two options to do this. Option 1: Send an amount to Tencent. Using this option, you don’t have to verify your account. Option 2: Receive a transfer from Tencent. In this option, you’ll need to verify your official account within 30 days. Enter the details of the account operator. Put in the account name information. Congrats! Your official account will be ready to roll after 7 business days. 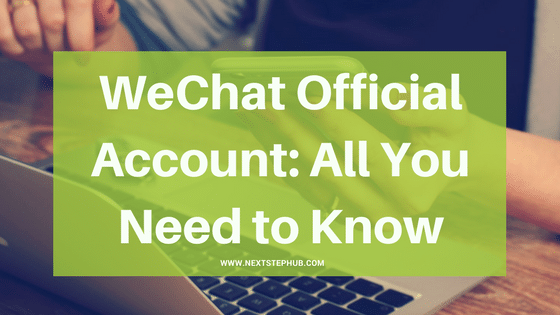 If your company isn’t registered in China, you have two options to create a WeChat Official Account. Your first option is to go through Tencent’s application process. This will give you full control on your account since you’ll use your business license. The application process takes 2-3 months and costs $120. Having an official account is better, but it won’t do the work itself. Here are some tips you can use to step up your WeChat marketing. WeChat is the best place to promote your brand, but constant promoting can be annoying to your followers. Try to involve your audience in your every post. Share content that can help them or they can relate to. Customers nowadays don’t just look at a product. They also look at a company’s values and culture. Spice up your posts by using videos, GIFs, or memes. Constant posting of pictures or texts can bore your audience. WeChat gives you the option to directly sell your products to your followers. Your customers can easily shop online with the help of WeChat Payment. Reaching out to your audience is convenient in WeChat. You can send them personalized messages and templates. Use this feature to collect feedback. Ask your followers what they think about your services and what needs improvement. Their opinion will help shape your future strategies. The official account offers a wide range of features. You can create mini-games, online quizzes, almost any kind of content. Think outside the box and come up with interesting ideas that can engage your followers. WeChat is a versatile platform and adapts to the needs of the users. Watch this space for latest WeChat related news to keep your marketing and official account up to date.